Is your sales and marketing relationship frictionless? How to master sales and marketing alignment with Sara Larsen at Vainu. According to Sara Larsen, Head of Business Development at Vainu, most frictions in companies today stem from the sales and marketing teams not sharing the bedroom. She’s a huge proponent of joint KPIs for the two teams, challenging sales managers to think more like the marketing manager, and vice versa. I started following Sara Larsen on LinkedIn a year ago when I became active on the platform myself. Sara writes and vlogs content around sales and marketing topics for her 12,000 followers daily. I wanted to ask her about the future of sales and asked if she would like to do a video interview with Oneflow TV. And so she did! How she grew her LinkedIn presence from 0 to 12000 followers in a few months. How she uses her online presence and fine-tuning her tonality to get meetings with clients. How self-awareness, patience, and discipline are the keys to her success online and offline. How marketing plays a role in sales and vice versa. Keeping up with the pace of sales. One of the most important takeaways from the interview is that the pace of sales is faster than it’s ever been. Business is happening at a rapid pace. That’s why Sara spoke about real-time sales, a new way of conducting sales that will soon become “standard”. Our buyers want it right now. We are all getting very impatient. This doesn’t only mean that the sales team must always be on and available at all time. It also means that there should be as little friction as possible in your entire sales process. Revising a proposal based on feedback from the prospect. Following up on a sent proposal, multiple times. Following up on an approval from your manager. Waiting for a signature from the prospect. A frictionless sales process from proposal to sign. At Oneflow, we are driven by eliminating the frictions that can occur during the sales process, and especially within the negotiation process. We have seen companies cutting down their sales cycle in half, leaving more time to close more deals every quarter. Make it ridiculously easy to sign from any device. Collaborate “live” with your prospect and other stakeholders. Use approved templates for quotes and proposals to minimize errors. Use interactive product tables that do the maths for you. Automatically notify all stakeholders when there are changes to the contracts. 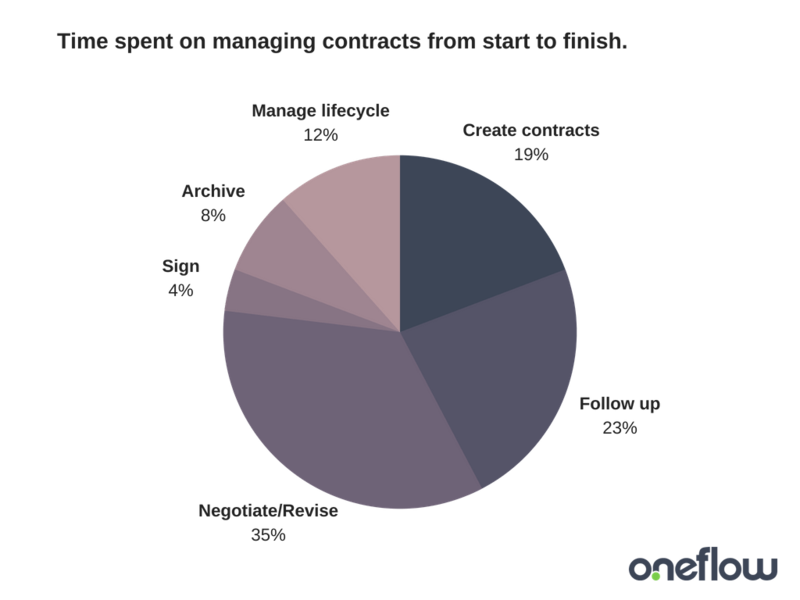 The pie chart above shows how much time a typical salesperson spends on managing contracts or proposals (or any documents requiring a legally binding signature for that matter) from start to finish. It is a misconception that simply using an electronic signature will solve all issues in regards to the sales process. E-signing will only help speed up a small fraction of the entire sales process. The potential lies in automating tasks that happen before and after the signing takes place. As you can see, a typical salesperson spends the most time in revising the proposals and following up. Take a look at how e-contract automates these tasks from start to finish on one platform.